Poker is at an all-time high for content. There was a time when you'd have to wait once a month to receive a magazine full of interviews, photos, strategy or stay awake until at least midnight (depending on your time zone) to watch a cash game on television. Well that's all changed. We are now flooded with content on Twitch, YouTube, Twitter, Facebook, Instagram, you name it and someone is using it. But that's a good thing. Now more than ever, the "untouched" pros are just one click away. We have the ability to learn any bit of strategy within minutes, can cyber stalk our favorite players — because they all vlog now, and we are more entertained than we ever have been in years past. That being said, it's also hard to keep track of who is posting what on any given day. Hopefully this will help. These are the best pieces of content found for the week. In case you didn't know, Poker Night in America has a new show, Poker Night LIVE on CBS. It runs every Tuesday and has had some pretty great lineups. In case you missed it on CBS, they've been posting the episodes each week on YouTube. The "Rock Royalty" episode featured Jerry Cantrell of Alice in Chains, Scott Ian of Anthrax, actress/model Shanna Moakler, music manager Marc Pollack, and WSOP/WPT champ Gavin Smith. Joe Stapleton, who you are used to seeing (or hearing) commentating, has now become a weekly player. If you're a fan of Bekah M from "The Bachelor" then keep an eye out for that release. She was on with David Williams, Real Housewives star Alexis Bellino, and Survivor outcast Tyson Apostol. Everyone and their dog is probably following Doug Polk and even has notifications set to be alerted each time he even sneezes but just in case, we thought this little tidbit was funny. Can't help but enjoy when poker pros needle each other. 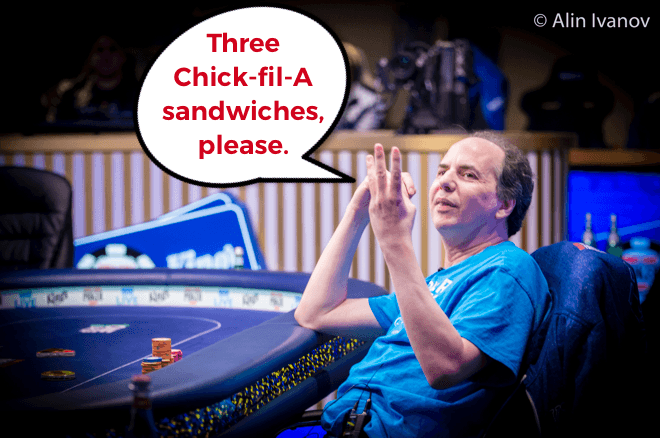 Allen Kessler is a special one. This week he decided to call out Wendy's for its "flattened chicken." He went for the extra jab by saying Chick-fil-A was better. Still no response from Wendy's though and frankly, we are disappointed. Maybe there was too much of an initial effort and Wendy's will throw the surprise punch in a few days. Here's hoping. Run It Up has been crushing Twitch editing for weeks. Now in its sixth episode of "Top Twitch Poker Moments," these things are really starting to gain some steam. Twitch clips are pretty great already, then you take a comedic genius (whoever is editing them) and now they are Twitch Poker gems. Joey Ingram released a Part II Poker Life Podcast with Barry Greenstein. His first one was four hours long! But it was amazing. Why? Barry Greenstein is a storyteller and whatever he's saying, you want to be listening. Part II was — my gosh — another four-hour episode. This time he told more stories on Bobby Hoff, Sailor Roberts, Doyle Brunson, Chip Reese, Amarillo Slim, Benny Binion, Bobby Baldwin, Jerry Buss, Ted Forrest, Sammy Farha, and Gus Hansen. If you've got four hours to spare, give it a listen. Maybe even on 1.5 or 2x speed.